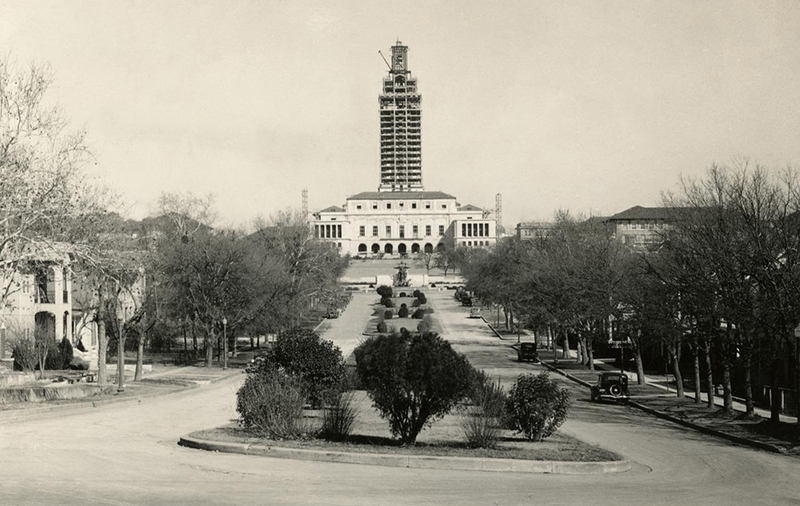 The 307-foot tall UT Austin Tower was completed in 1937 and through the years has served as the university’s most distinguishing landmark and as a symbol of academic excellence and personal opportunity. Designed by Paul Cret, a French-born architect then living in Philadelphia, the Main Building was created to house the university’s central library. Along the east and west sides of the building, a pair of spacious reading rooms, labeled the “Hall of Texas” and the “Hall of Noble Words,” connected to a great central reference room. Made with liberal use of oak and marble, the room was decorated with the six seals of Texas. 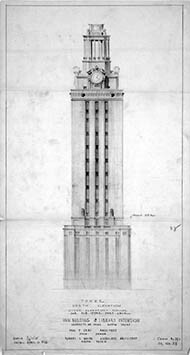 Rising twenty-seven floors above the reading rooms, the Tower contained the library’s book stacks. Made of Indiana limestone, it was financed through a grant from the Works Progress Administration, a New Deal program created during the Great Depression. As a closed-stack library, its patrons searched an immense card catalog to identify their selections, and then requested books at the front desk. Orders were forwarded upstairs to a Tower librarian, who often wore roller skates to navigate the rows of bookshelves. Once found, books were sent downstairs in a “dumbwaiter” elevator to be checked out. As both enrollment and the library’s holdings grew, the waiting time for a book extended to more than half an hour. The need for an open-stack library led to the construction of the Undergraduate Library and Academic Center in 1963, and the Perry-Castaneda Library in 1977. Today, while much of the Main Building is used for administrative offices, students can still study in the grand reading rooms, which now contain the Life Sciences Library.